Hilda Lunn Swearingen, age 85 of Orlinda, died Thursday, January 10, 2019 at NorthCrest Medical Center. Funeral services will be conducted Wednesday, January 16, 2019 at 1:00 PM in the Oakhurst Chapel of Robertson County Funeral Home with Bro. Joe Rushing and Bro. Johnny Trail officiating. Burial will follow in Springfield Memorial Gardens with Wade Swearingen, Davis Murray, John Michael Hobdy, Archie Prince, Herbert Wade, Sammy Justice, Jody Swearingen, and Bill Swearingen serving as pallbearers. Honorary pallbearers will be David Anderson, Tony Austin, Paul Wisener, Harold Jackson, and Aubrey Browning. The family will receive friends at the funeral home Tuesday from 3 until 8 PM and Wednesday from 11 AM until the hour of service. Mrs. Swearingen was born August 26, 1933 in Davidson County to the late E.F. and Verna Langsdon Lunn. She was a member of Hillcrest Church of Christ and previously a member of Main Street Church of Christ, where she taught the 4-year-old Sunday School class for more than 30 years. After graduation from Isaac Litton High School, she worked at First American National Bank until she married. She was a former secretary for the Robertson County School system, working at North Robertson Elementary, Krisle Elementary, Robertson County Learning Center, and Springfield High School. After her retirement from the school system, she worked at the Main Street Church of Christ Mom's Day Out program for several years. 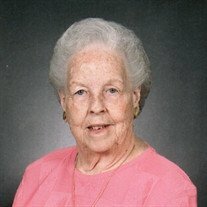 She was a wonderful cook and enjoyed being around people, especially her family. She spent time each day reading her Bible. In addition to her parents, she was preceded in death by her husband, L.D. "Hoot" Swearingen, and a sister, Bonnye Knight. She is survived by her sons, Dale Swearingen and wife Karen of Orlinda and Joe Dodd Swearingen and wife Julie of Springfield; brother, Phillip Lunn and wife Anita of Pleasant View; sister, Maye Lunn of Pleasant View; grandchildren, Wade Swearingen and wife Laura of Springfield, Ana Swearingen of Springfield, Megan Murray and husband Davis of Springfield, Haley Hobdy and husband John Michael of Cross Plains; and Ava Swearingen of Springfield. The family requests, if so desired, for memorial contributions to be made to either the Hillcrest Church of Christ Building Fund, Main Street Church of Christ Mom's Day Out, or St. Jude Children's Hospital. All donations can be sent c/o Robertson County Funeral Home. Robertson County Funeral Home was in charge of arrangements.